A cloudy and a cold morning had no influence on our persistence to visit the island that I was hoping to visit for a long time. The five minute walk in Hartland led us to the place where we had to board our helicopter. This being my first time, had me getting on my toes. I could see the Island over a distance on the horizon. Once in the helicopter, the astounding view from the helicopter window got me grabbing for my tissues. The flight lasted for a full 10 minutes, later landing on a rainy Lundy Island. Fig1. My first time using a mist nest. Photo taken in Hartland. After a day’s preparation for the coming busy days with our sparrows, Alfredo, Antje and I started catching birds using mist nets, ringing them if they weren’t previously ringed or had lost some of their colour rings, and measuring them. For both the sexes, we measuredthe tarsus, wing, beak length, beak width and the tail length . Additionally we measured the badge and the mask of the males. For a long time the Island has been a residence for the house sparrows. Various scientists made frequent visits, setting up nest boxes as homes for the birds. 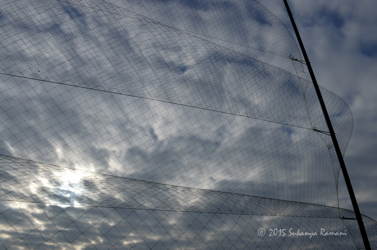 Mist nets were built at various places in the Island, where the possibility of catching sparrows was high. Like for them, each day’s routine would consisted of us waking up early in the morning, setting up our mist net and wait for some sparrows to fly into our traps during dawn. Occasionally, we also caught different birds such as wrens, robins and starlings. The number of individuals that we caught varied each day. There were some busy days, capturing birds way past dawn. We also caught some individuals in nest boxes which were mounted in certain places in the Island. In total we caught 122 birds, of which 84 individuals were unique which I think is a great feat accomplished within the 7 days of our stay in the Island. This trip has made a strong impact on my perspective on field work with birds, which is not only fun, but also challenging. Research in the island would not have been possible without its residents, who are very kind and generous. 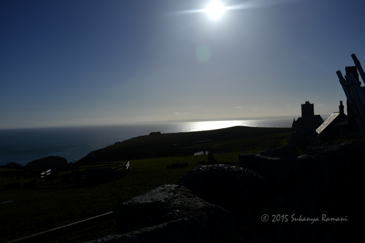 I hope to visit Lundy back in summer. I thank Julia, Alfredo and Antje for giving me this opportunity to work with this project and for their patience.